The scribble drawing exercise can be used as a tool to get away from conscious drawing and enable us to tap into our imaginations or unconscious. In the activity I approached my paper feeling loose, comfortable and calm after doing a relaxation exercise and wide arm movement exercise. I let my hand connect with the paper in large sweeping motions. Next, I removed the paper from the easel and viewed it from different positions until I saw a pattern forming in the scribble. I started creating from an intuitive stance and I engaged in a humorous and playful scene which portrayed transformation. I discovered an archetype in my drawing performing a ritual. She was the Heirophant, a muse, a spiritual translator or a woman with power and knowledge. She can represent wise counsel or the need to rebel and think on your own. She symbolizes external control or the wise woman. She felt light, kind and playful. I was reminded of the butterfly woman in Women Who Run With the Wolves. Under her feet was the teaming life force pulsing with energy. I could hear drumming and feel dancing. My woman was light, balanced and she drew energy up her body to perform a ritual with her partner, a male. It flashed through my mind that this could be a curse or a blessing, how thin the line was between the two. What she was performing felt profound yet so simple. It reminded me of the feeling when I glimpse some awareness or truth and part of me can’t believe that I haven’t known this simple piece of the puzzle all along and part of me wants to jump in ecstasy at this new revelation which is going to change my life. Next I joined with a partner to work on a scribble drawing. We started by each of us doing our own separate piece. We picked mine as the one to work on together as it seemed to have the energy flow that matched our moods. First, we worked on our own respective sides until we felt free enough to move more freely around the drawing. 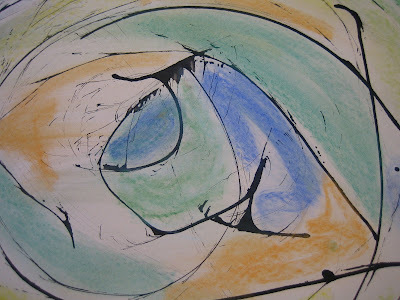 We both were intense and engrossed in the development of the abstract drawing. I was drawing energy and continued to work with the feelings and thoughts that the first drawing had stirred up. My partner was working in a rhythmic way with energy and she said afterward that she was still feeling the energy of her first work. For me this exercise was an interesting wind down or closure activity for my first experience. This exercise would work well for; those who are ready to make their unconscious material conscious; those who want to explore their symbolic language and archetypal influences; and those who want be freer in their expression of art. If you're into art, scribbling can be a great start. It can be considered as some sort of a practice. I've been doing a lot of drawing since we've moved here in Jacksonville. I really want to be good at it. I've been looking for art inspirations all over the web, and I've never thought that there's art therapy. First thing that came into my mind when I heard it was people looking at soothing art. This is certainly a good resource for those who are really into art like me. The reason why I got into drawing is that I want to design my own website after I find a good hosting company. Thanks for sharing your stuff, Ms. Wallace! Keep up the good work! Scribbling, huh. I didn't know that it could be used for therapy. Well, I kinda understand how it jives with therapy. You know how you can sense what the person feels by the amount of pressure he or she exerts in drawing a line? Well anyway, I kinda dig these scribbles. These can be used to make an awesome graphic design for T-shirts and stuff. I think I'll make bookmarks with scribbles for my bookish friends over at Memphis, TN. I love the scribble drawings. They are very loose and free. Beautiful work. Hi Karen, I just linked to this post on my scribble drawing blog (indygold.tumblr.com). Are you still doing scribble drawings? Hi there- what are some good processing questions for this directive?